I’ve been looking at the Amazon top sellers for parenting books and Annabel Karmel hits the top spot over and over again. I remember seeing her cooking on TV one day, with her perfect grooming (to be expected on TV), and her supposedly simple recipes, that she was cooking ALONE. No baby demanding to be held. No toddler wanting attention. Now admittedly, my little monster is now 3.5yrs old, and in the past few months there has been more space for me to cook. But 3 days a week there is also more pressure; I pick him up at 6pm from nursery and aim for him to be in bed enroute to sleep by 7pm. Plus, in a very few months there will be another mouth to feed and I’ll probably be back to square one!. I didn’t puree organic stuff for little monster when he was being weaned. It would have taken me hours, while he was unhappy, wanting me to be with him, and then he probably wouldn’t have eaten it. He tried baby rice first, then got a stomach bug and refused anything glupey, so I ended up ‘baby led weaning’, without really knowing it existed. I was nearly pulling my hair out, when a Mum popped a strawberry in his mouth, and I realised he just wanted to go straight onto solids (ok so maybe a strawberry wasn’t such a good idea in hindsight – but he didn’t tend to have allergies – phew!). It was tough, because obviously he couldn’t get large quantities of food in him, and he hated the basics – banana, potatoes & avocado! But as the months progressed, I was beginning to have an easier life and my friends were having a more difficult time with lumps and progressing onto ‘normal food’. A couple of local restaurants with lovely pasta or rice dishes, were my options for igniting his appetite every now and again, and then at 18 months he started nursery, and peer pressure sorted the rest out! They give you the impression that weaning is over after a few months – but it actually takes ages and ages and AGES and AGES!!!! I got over the guilt of being a ‘rubbish cook’ early on. Now I do understand that what you say about yourself, does tend to become true. But I view my assessment of my cooking skills as a fair view of what I am good and not good at! I can cook pasta, and rice, and stir fry chicken with an added tomatoe (Tinned tomatoes) or creamy (creme fraiche) sauce. Curly Headed Boy isn’t keen on lots of veg, but we tend to manage to negotiate on a few peas or sweetcorn, and I haven’t gone to the lengths of pureeing up veg into a sauce for him. He eats fruit, and doesn’t have sweets/crisps every day. So I reckon all in all, he’s not got the best diet, but it’s not awful either. Other Mums are undoubtedly better than me. They know how to make gravy, ommlettes and stews and can even bake cakes! But when you look at my history with cooking, I realise that actually I’m doing pretty well. I’ve definitely improved on my background, and that’s not bad at all!! To start with my own attempts at cooking have not worked well for me. There was the time that I ran the whole household at 10yrs old when my Mum was on one of her numerous trips to hospital. I’m talking full sunday dinners for Dad and my 3 older brothers; I was the business! On her return home, I was unceremoniously sacked. Now as a Mum I can understand she was just wanting to reduce the responsibilities on my small shoulders. But at the time I vowed ‘never to cook again’, and that appears to have stuck! For a bright girl, cookery classes were the trauma of my life, especially during my General studies A level, as they were followed by double Maths and triple Physics practical; not good mondays (thank God I was doing English too!). I was just incapable of following a recipe, things would always go wrong, and the more stressed I got, the worse it got! I struggled through Uni, and then met a bloke who could cook, how fabulous! About 13 years later we decided to go for a ‘quality’ life in a country cottage and I became all domesticated, with a friend teaching me how to cook and garden. But what sounded like a good idea at the time, decimated our relationship. I realised, we are loads better off when I’m a rubbish cook! But am I really so ‘rubbish’? Lets look at the genes that I came from. At other points in history when Mum was in hospital, I existed on toad in the hole and her hospital dinners (poor woman must have been starving, I hope they gave her extra! ), so it wasn’t Dad’s key skill either. There was the ‘stock pot’, which looked like Alien growing in one of those vision (cook proof glass) pots, all week on the stove. Or the time I cleaned out her cupboards to find tins in shillings and pence – there was no best before date according to her on a tin! Bless her, she was a hoarder, and always had to have about a years supply of food. Or another time she went on holiday and I cleaned the kitchen walls to discover they were white, under the thick layer of yellow greece & tobacco. Or when I found that she was buying cold cooked ham and putting it in the freezer, to be defrosted and eaten later. 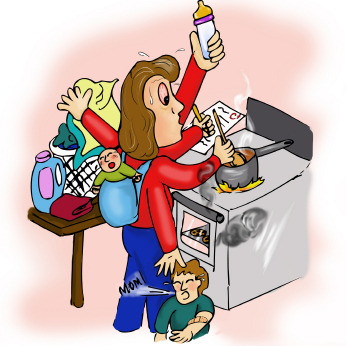 But the best was the discovery of a mouse cooked with the roast potatoes, and Mums solution to pick it out and bring them back – after all, the germs would have been removed in the oven!! When I went to Uni, I did notice that on arriving home during the holidays, it appeared to take me some time to settle back into the food routines of home, i.e. rebuild my immunity. As I left home and grew older, I would actually bring my own can of coke, and refuse her kind offers of coffee, just incase. Bless her, she had managed to raise 3 boys and me without killing us. I went to one of my brother’s houses a few years ago and found his wife struggling with the same problem ‘but the ham’s fine, it’s not green’ he said! Are you comparing yourself unfairly with people who are naturally domestic goddesses? Take a closer look, with a strong pinch of humour, and I bet you’ll fine you’re not so bad after all. oooh when you say ‘batch cooking’ that puts you in the ‘good cook’ group! You’re doing well! I come from a family of excellent cooking and home-made-ness but I totally identify with what you’re saying about not having time to prepare anything elaborate when the children need you. I’m starting to wean EP now and she’s just having mashed up what we’re having. Lol, I’m still laughing. That is an awesome story. The rat!!!! Ahh funny. I don’t really remember my moms daily cooking, but what stuck with me was when she had a bit of time on Saturdays (We had school in the mornings back then) and we got to wish for our favourite foods for after school (Probably as a treat for having 6 day weeks, ugh!). To us it felt really special to be able to wish for what we liked and it felt like she’d make a real effort for this, which she probably did, yet they were usually relatively simple dishes like Shepard’s Pie or Lasagne which you can make in the oven while doing other things and heat up easily too. Unless you have mold or rats or any of the above *lol* I don’t think kids worry too much about how healthy, hard to cook or gourmet moms food is, it’s just kinda cool to have moms cooking every now and again, because it’s mom.